Zündapp was a large manufacturer of motorcycles, at one time, the world’s largest. They produced motorcycles from 1920 until 1975. 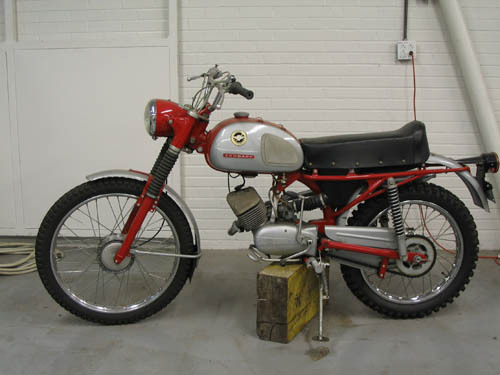 This is an example of a 125cc on-off road bike that was popular in the 1970s. Its lightweight but modestly powerful engine allowed you to drive down the road, yet also enjoy an occasional trail ride through the woods. Zündapp ceased production in 1984, and the factory and tooling were sold to China, leading to the “Jing Gang Shan” brand, roughly doubling Chinese motorcycle production and revolutionizing the transportation industry in a very short period.